Bollywood actor Amitabh Bachchan got his chance to be part of the Olympics – a chance very few people get! The legendary actor carried the Olympic flame in London on one of the final relays before the opening ceremony of the 2012 Olympics in London! 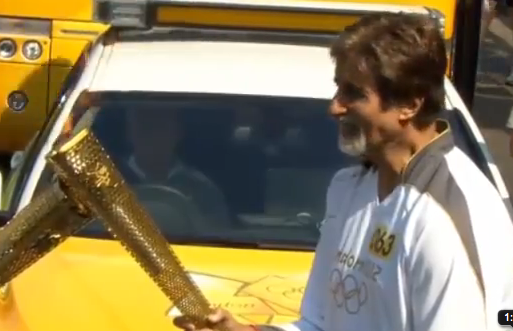 (Video of the torch being lit and Bachchan running with it below). Bachchan was no doubt as excited about his experience as all of India was to watch him do it. The 69-year old actor has said he would cherish the moment for his entire life. The famous Indian actor, producer, and singer has appeared in over 180 films, and has won too many awards to count. He sealed his claim to fame with his rold in the 1973 film Zanjeer where he became known as “the Angry Young Man”. He had a brief period of retirement in the ’90s before a stunning comeback in recent years starting with his role in Mohabbatein. News 2012, Olympic torch, olympics. permalink.